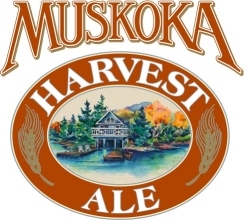 BRACEBRIDGE, ON – Great Canadian Pubs & Beer reports that Muskoka Cottage Brewery has released a new seasonal brew, Muskoka Harvest Ale. Muskoka Harvest Ale is an American Pale Ale. For it’s inaugural year, our Harvest Ale has been hopped with Ontario grown cascade hop leaves. This ale is also dry hopped which contributes to a subtle grassy character reminiscent of the harvest. It is refreshing and crisp and has a nice malt base. Close your eyes, savour the nose, taste the ale and celebrate the harvest. Expect the character of this beer to evolve as owner Gary McMullen sources out malt and hops from Ontario growers. But this year’s first attempt is worth the sipping – a big ale with a ton of hops in the nose and taste. Higher alcohol content (around 6.3%) helps punch up the flavour but it’s short of bringing in that sweetness that often comes with the even higher alcohol contents.